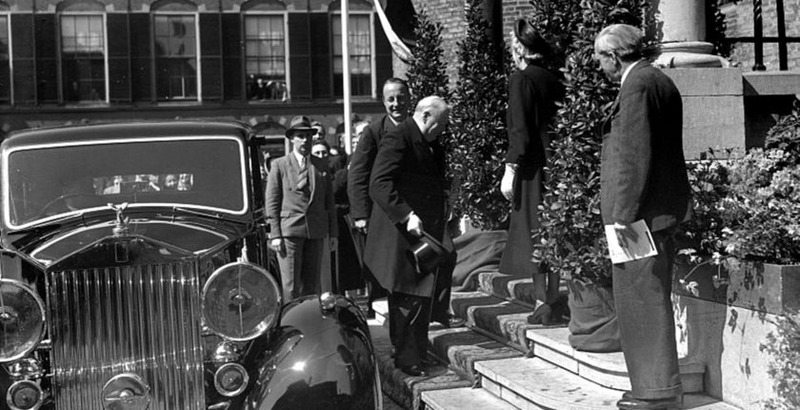 Featured Image: Churchill (Clementine to his right) arriving at the Congress of Europe at The Hague, Holland, 9 May 1948. (Nationaal Archief Nederland – Wikimedia Commons). In Great Britain’s June 2016 “Brexit” campaign, both the Leave and Remain sides were trying posthumously to enlist Churchill as a historical supporter. His ghost was simultaneously summoned both as an icon of modern British independence and as a founding father of European unity, notably because of his use of the phrase “The United States of Europe” as early as 1930. In the postwar years, one must discount his prewar pronouncement, “We are with Europe, but not of it,” as a call to keep aloof. By 1948, faced with a Labour government that was retreating from Empire, a strong external Soviet threat, and an American ally that wanted a stronger Western alliance, Churchill had accepted that Britain’s immediate future lay not just with Europe but in Europe. The form that would take is of course debatable, but that he saw the need for close collaboration is unarguable. To what extent his views on Europe changed on his return to office as Prime Minister in 1951 must be left for another article. In 1946 Churchill made two speeches which he believed to be as important as those he had made in 1940 against Hitler: one at Fulton in March and the other at Zurich in September. He then perceived a menace almost as great: Stalin’s occupation of Eastern Europe and his threat to Western Europe. There were two imperatives: to persuade the United States to commit its resources to the defence of Europe and to invest in the economic recovery of Europe. In both speeches, his agenda was to inspire a new Western alliance in which a rejuvenated Europe was essential. The Zurich speech challenged the status quo as robustly as Fulton, and the response was just as divided. In little more than six months, Churchill had changed perceptions and altered the horizons of the West. It would be a mistake to think of Churchill’s view of the English-speaking peoples as standing outside, or isolated from, the broader European and Western tradition of liberty. In many of his speeches Churchill insisted that Britain was defending the liberties of all Europe, not only Britain’s. He had been a great admirer of European culture throughout his life and one of the first members of the “Pan-Europa” movement set up in 1923-26. Still, Churchill was not impressed by the revolutionary language of innovation that produced so much enthusiasm among intellectual circles on the European continent and elsewhere. He did not draw a systematic comprehensive rival doctrine against Communism and Nazism. What shocked Churchill was precisely the ambition of both Nazism and Communism to reorganize civil and social life from above, imposing on existing ways of life a deductive plan based on a total, comprehensive ideology. Basically, he was an interpreter of and heir to a Burkean spirit which is sceptic of dogmatic abstractions and of geometric plans to re-design decentralized institutions and traditions. The article examines the impact the Commonwealth had on Churchill’s Europe when he was Prime Minister again in 1951-55. The British Commonwealth had helped save the war-torn face and democratic body of Western Europe when coming to the rescue of isolated Britain in the first two years of the war, something which Churchill never forgot. His multiple conversations with old and new Commonwealth leaders helped shape Churchill’s pro-special relationship vision of Europe in the 1950s. To him, the outward unity of their individual positions and actions illustrated that the new Commonwealth was, in its own right, an inclusive and modern organization which could hold its own against or alongside both America and Russia. Churchill revealed himself to be a true European because for him political unity and an envisaged common destiny were his vision for the future of Europe—similar principles to how he had come to view the Commonwealth’s position within the postwar world. Churchill’s last private secretary Anthony Montague Brown’s said in 1995: “When it came to France, ambivalence [on Churchill’s part] was evident.” This ambivalence was evidenced by the image of Churchill the statesman and impeccable British patriot, versus Churchill the private man and Francophile. When the interests of France coincided with those of Britain, all was well—there was no conflict of loyalties in his heart. But when he felt that British interests were threatened, he naturally gave them priority – somehow suffering from a sense of guilt towards France. This made him irritable, often unpleasant with his pro-French British entourage (one may think primarily of Anthony Eden) and his French interlocutors (de Gaulle springs to mind). He became ill at ease, impatient, dismissive of contrary arguments, all the more so if he knew that he was in obvious bad faith. These inner conflicts only came at a late stage in his relations with France and the French, first at the Paris Peace Conference in 1919. The article therefore distinguishes between several stages in this long relationship: 1874-1918, 1919-1932, 1933-1939, 1939-1945 and 1945-1965. In the shadow of “Brexit,” the scholarly debate has focused on the role Churchill believed Britain might play in the European postwar order—whether Britain would be an integral nation within the “United States of Europe” or if like a flying buttress (to parallel Churchill’s famous analogy), Britain would support Europe from the outside. This debate overshadows interesting questions. For instance it overlooks far more basic issues like which countries should be members of a European order. In theory, for Churchill, qualifications for membership in the United States of Europe was simple: “Any European country that sincerely accepts and adopts the principles set forth [in the Charter of Human Rights proclaimed by the United Nations] will be welcome by the European Union” (Brussels, 1949). What of Turkey, like Britain a geographical outlier struggling with its “European” identity? Churchill always celebrated the complex identity and dual role of Britain, at once a European state and an Empire and Commonwealth in its own right—so there is no reason why Churchill would have not also celebrated the complexities of Turkish identity and its dual role as a European state and a Middle Eastern state. Memories of his Victorian education and early days as an Edwardian statesman left him with the strategic notions of Turkey bolstering the Southern European flank and providing an alliance with other Islamic states in the post-1945 world. Antoine Capet, FRHistS, is Professor Emeritus of British Studies at University of Rouen, France.